...a fearsome beast that threatens to devour meeples. ...repels the Dragon and grants bonus points. ...distracts knights from performing their duty. ...enable you to place meeples on already placed tiles. 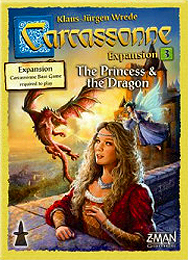 You need the CARCASSONNE base game to play this expansion!